These different cat breeds belong to the Preliminary New Breed Category. This is the beginning level of the Championship Advancement Class Program. These breeds of cats can be shown in TICA shows but cannot earn titles. To be eligible for advancement they have to follow specific rules. The different cat breeds in this category are the Donskoy, the Highlander long hair and short hair, the Kurilian Bobtail long hair and short hair, the Minskin, the Ojos Azules long hair and short hair, the Serengeti and the Sokoke. The Donskoy originally comes from Russia, where Elena Kovaleva rescued a kitten in 1987 from being abused. Due to stress the kitten started losing its hair. This hairless cat later on gave birth to kittens who soon after birth started losing their hair. 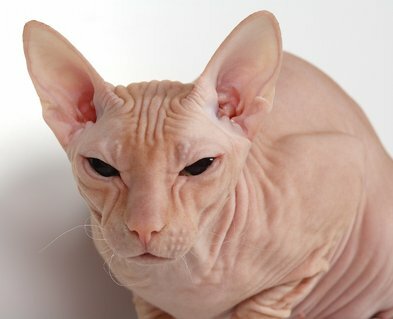 Irina Nemikina who is a professional cat breeder took a kitten and bred a new breed of hairless cats which she called the Don Sphynx. In TICA registries it is known as the Donskoy. This different cat breed is truly different in looks! The Donskoy is an elegant, active, social and people-orientated cat. This hairless cat gets along well with other pets and should never be without a companion - be it human or another pet. The Donskoy comes in 4 different coats types in a variety of colors. A dominant hair loss gene causes the Donskoy's birth coat to fall out. The coat types include flocked, velour, brush and rubber bald. The flocked variety is born with a thin coat that falls out and the result is skin that feels like a chamois cloth. The velour variety is born with hair, but with a bald spot on top of the head. They also lose their hair over time and become completely bald. The brush variety only loses part of their hair over time. The coat is soft, wavy and wiry with bald areas on the head, neck and back. The rubber bald variety is born bald and stays bald. The Donskoy usually grows a winter coat that appears as fine hairs on the chest and on the end of the tail. Once spring starts, they will lose this hair again. 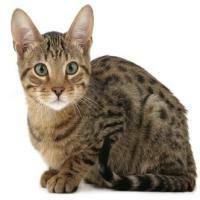 This cat breed's skin is similar to human skin in that it sweats when it is hot and can get sunburned. As the Donskoy's skin is very sensitive to sun, you should take care not to let the cat get sunburned. These hairless cat breeds are better suited to a warm, dry climate. The Donskoy is medium-sized and strong boned. The front legs are shorter than the back legs, but are still in proportion with the body. They have very long and slim toes with a thumb, this gives their paws the appearance of being like monkey hands. My apologies, no picture yet! The Highlander is a very new different cat breed that began development only in 2004. The Highlander's roots can be traced back to the Highland Lynx and for a while the breed name had Lynx in it to describe it. This part of the breed name was removed in 2005 as the domestic Highlander is not of any lynx descent and is a breed on its own. The breed has both short hair and long hair varieties that both have loosely curled ears with a bobbed tail. The Highlander is an extremely affectionate cat and will greet all your visitors. They are loving, loyal and very playful, enjoying games where they are the center of attention. The Highlander enjoys grooming sessions and with the long hair variety it is advisable to do grooming at least twice a week to prevent the coat from becoming matted and dull. With the short hair variety a grooming session once a week is sufficient. The Kurilian Bobtail is a natural breed of cat that originated from the Kuril Islands that stretch from Russia to the Japanese island of Hokkaido. It's been reported that tailless cats have been on these islands for over 200 years, and in the middle of the 20th century, scientist brought some of these cats to Russia. The Kurilian Bobtail is still unknown in North America, with less than 100 of the breed in the United States. The distinguishing feature of the Kurilian Bobtail is its tail that looks like a pom-pom. No two cats have the same tails - each has its own unique tail structure. 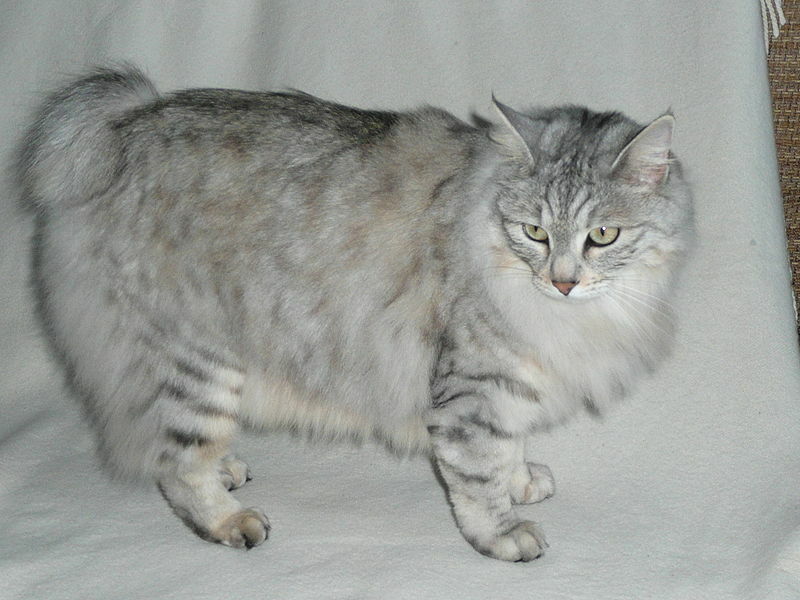 The Kurilian Bobtail is a medium to large sized cat with a semi-cobby body shape. There are long hair and short hair varieties and their coats comes in solid or tabby colors. The Kurilian Bobtail is very gentle, playful and sociable. They get along well with children, other cats and other pets. These cats are excellent jumpers and enjoy games that involve lots of running and jumping activities. Paul McSorley started developing the Minskin in 1998 by crossing a Munchkin with short legs and fur with a Sphynx. He wanted a different breed of cat with short legs and fur that is restricted to the points - as with a Sphynx. In 2000 the first Minskin was born to met his specifications. The body has a sparse coat and feels warm to the touch. The coat can come in all colors and patterns. Very little hair is shed, so very little grooming is needed. The Minskin has a semi-cobby body type with the characteristic short legs of the Munchkin. The head is rounded with large ears and large eyes. The Minskin is a friendly and playful cat that enjoys the company of its humans. They are intelligent and need games that stimulate them. Ojos Azules is Spanish for "Blue Eyes." The Ojos Azules is a new breed of cat and was first reported in New Mexico in the mid 1980's. The unique eye color is as a result of a genetic mutation. Unlike cats with point coloration and blue eyes, the Ojos Azules comes in any coat color and variety, resulting sometimes in a striking black cat with piercing blue eyes. Both the long haired breed and the short haired breed was only accepted by TICA in 1991. 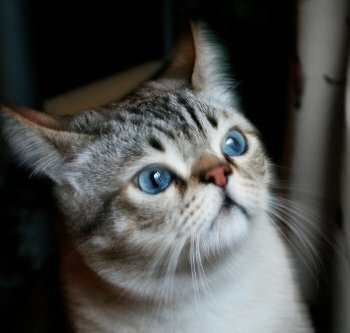 Breeding was temporarily suspended when it was discovered that the mutant gene responsible for the blue eyes, could cause skull defects and mortality in kittens. Breeding was later continued when it became apparent that the mutant gene is harmless if existing in heterozygous formation. Very little is known about the Ojos Azules and in 1992 it was recorded that only 10 of these cats existed. 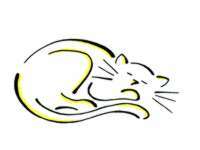 The Serengeti cat was created by Karen Sausman, owner of Kingsmark Cattery in California. Her idea was to create a domestic cat breed that looked like the African serval. Unlike the Savannah cat breed though, the Serengeti does not have any serval blood in it. 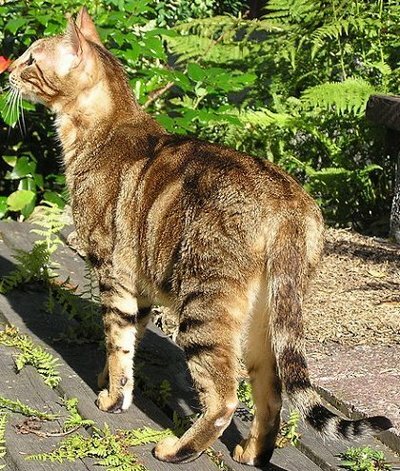 The Serengeti was created by cross-breeding Bengals and Oriental short-hairs. The Serengeti is a medium sized cat with long legs. Their short coats are yellow to gold with widely spaced black spots. Solid black coats also exist. The Serengeti has very large ears and large eyes that are gold or amber colored. This cat breed has an upright posture with the large boned structure of the Oriental cat. The Serengeti is a very loyal and human-orientated cat. They are very active and extremely agile and make graceful jumps. The Serengeti is a vocal cat due to its Oriental blood, and will often have a "conversation" with its human. The Sokoke is a natural breed of cat, occuring natively in Kenya. It is not sure when it actually became a breed of cat. The Giriama tribe in Kenya were the first people to live with this cat breed. Jeni Slater discovered wild kittens on her coconut plantation in 1978 and kept two of these kittens that she later bred together. A friend of Jeni, Gloria Moeldrup imported the first two Skokokes to Denmark in 1984. Four more Sokokes were imported in 1991 and 1992 and in January 1994 FIFe (F�d�ration Internationale F�line) recognized the Sokoke as a Championship breed. In 2001 Jeannie Knocker researched the Sokoke breed and obtained some Sokokes. Jeannie Knocker's son contacted breeders in Europe and imported cats in order to start a new bloodline. Seven of the cats of the New Line were imported into the USA and in 2004 TICA accepted the Sokoke for registration. In 2008 the Sokoke met the guidelines and was advanced to Preliminary New Breed status. The Sokoke is a medium sized and muscular cat. The TICA breed standards recognizes only brown (black) modified classic tabby. Some of the combinations of the Old and New lines have produced pointed kittens and recently they also produced a blue kitten and a longhair. The Sokoke is a curious, active and territorial cat. They are very human-orientated and love attention and a rub from their owners. Sokokes love games with lots of activity and human interaction.